The treatment of pancreatic cancer various and is dependent on whether the disease is confined to the pancreas or has extended into vital adjacent structures (e.g. vessels) or spread to other organs (e.g. liver). 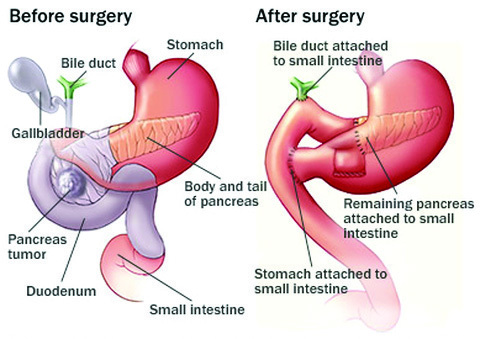 Generally, surgery can be considered if the disease has not spread outside of the pancreas. In these cases, the cancer can be completely removed. If the disease is in the pancreatic head, a “Whipple procedure” is performed, in which the pancreas is divided at the neck so the pancreatic head, the upper part of the small bowel and the lower part of the bile duct can be removed. In order to reconstruct the digestive continuity, the small bowel is joined to the pancreas, then to the bile duct and also to the stomach. If the lesion is more towards the tail of the pancreas, a distal pancreatectomy is indicated which sometimes can be performed laparoscopically. During this procedure, the pancreatic head stays behind and only the tail is removed. No reconstruction is necessary, but the spleen is often removed as well for oncological purposes. In cases where surgery is not indicated, chemotherapy is used to control the cancer. If the cancer is locally advanced and is without distant metastases, chemotherapy may be able to shrink the lesion and then surgery may become an option. The morbidity after surgery for pancreatic cancer is about 35%, and the reported mortality rate is approximately 3%. 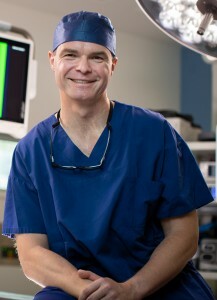 Dr Harald Puhalla is a General Surgeon with a private practice at Gold Coast Private Hospital and Pindara Private Hospital, Gold Coast Queensland. For more information about the surgical procedures offered by Dr Puhalla, please contact us to arrange a consultation or phone (07) 5503 1633.